Rasgullas are my weakness. I love the soft sweet delicious ball of cheese that is soaked in sugar syrup. It is soft when you hold it then transfer it quickly to your mouth and bite into it. Ahh! heaven the syrup oozes out and you get the first taste of the delight! First, let us get a warning in place You have to suffer my pictures in this post. I am too excited about them. Now, I have always wanted to make Rasgullas as they are my connection to childhood. Pappa took us to Anand Bhavan, a small place in Sitaburdi, Nagpur, where they served delicious Bengali Sweets like rasgullas, cham cham, and all the other delicious sweets whose names I do not remember anymore. Whether we had dinner or not is not what I can remember it’s just the sweets I remember, soft delicious and sweet. Pure bliss!!! 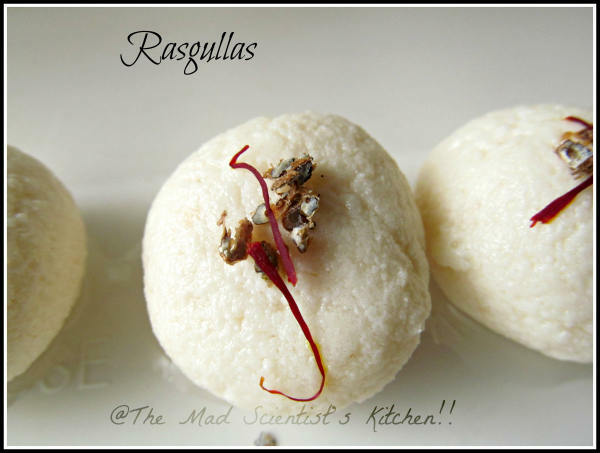 If there is something I adore its Rasgullas… and my attempt to make them is something that has remained that an attempt. The Rasgullas have always defeated me. So when I was stuck 2 litres of milk that sat on the kitchen platform without being heated on a hot sunny day I bravely decided to make Rasgullas. It would end my quest for the alphabet R! Now I followed two recipes and tried to blend them the first being Rak’s Kitchen and the second being the book, “Traditional Sweets”, by Mrs Malika Badrinath which Padmarekha had gifted at the BM#25. Look at the pictures and you will agree that the Rasagulla were a success in spite of me jumping from one recipe to another with mad abandon! 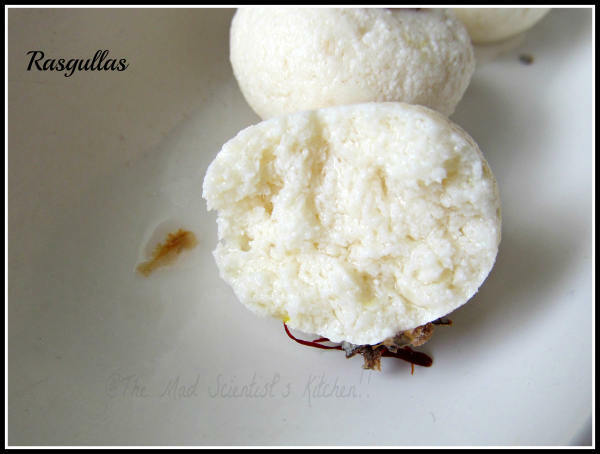 So here we get down to my mad recipe of Rasgullas before I forget what I did. By the way, the number I got is as many as you can see in the dish barring 1-2 which found their way to a waiting maw that was drooling over them and could not resist them. Heat the milk on low flame till comes to a boil.Add the lemon juice and stir properly. Heat further until the whey water clearly separates. Put off the flame. Add the Ice cubes to stop further curdling and mix well. 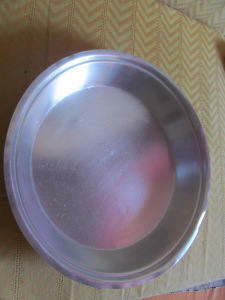 The ice cubes also prevent the chenna from becoming hard and helps for a soft texture. Strain in a metallic strainer lined with a soft cloth (This is the reason why my dupattas, my Father in laws dhotis do not get thrown out). You need to get rid of the lemon in your chenna so wash it well in the running water under the tap till the chenna does not smell of lemon. Then hang it for 30 minutes. After 30 minutes take the chenna in a thali (I used what is called a parat it’s a big plate but the edges are high so that the contents do not fall out. wait this is how a parat looks like) the chenna will be crumbly. That’s okay. Now knead this chenna for 7-10 minutes gently till it a soft and smooth dough. Divide the dough into small equal parts then make smooth balls. The number of balls will depend on the size of the balls you make. I made marble sized balls. Keep covered under a moist cloth to prevent drying. Next, take the 3 cups of water in a pressure cooker add the sugar and heat to and stir constantly to dissolve the sugar. After the sugar gets dissolved completely remove 1 cup of water in a different bowl and dilute with 1 ½ cups of water. Set aside. When the water comes to a boil add the chenna balls in the syrup gently one by one. Reduce the heat so that the syrup keeps gently boiling. Cover the pressure cooker with its lid upside down. Time yourself after 5 minutes remove the lid and with a spoon pour the little of the syrup we had set aside on each of the balls. Cover again and repeat the process 2 more times. Cook without the lid the last 5 minutes. At the end of 15 minutes, the chenna balls have now puffed up and are shiny. Remove the pressure cooker from the fire and transfer the balls to the thin syrup. Add the rose essence and keep covered for at least 8 hours. I stored them in the refrigerator. Serve chilled garnished with elichi and kesar. Use lemon juice and the milk should boil while you add the lemon juice. The kneading part is very important, knead smooth and soft with patience. In this series of blogging with alphabets here is what I have already blogged about. You can check us BMers all out here. Well then you are Most Welcome! I hope you keep coming back for more here. If you are my regular visitor then Thanks, for you encourage me to experiment more!! I would like you to please click on my link below and like my Face Book page. I will be happy if you can follow me on Twitter too! I just want to grab those from my monitor. I love rasgullas and yours look absolutely perfect. Pavani thanks for the like the pic comment. I have got some great pics to look at so its simpler now. Rosgulla looks very inviting Archana, though I confess I am yet to taste one, because the thought puts me off..:)..and amazing that you got so many with just half a litre..I like the way you have lined up! 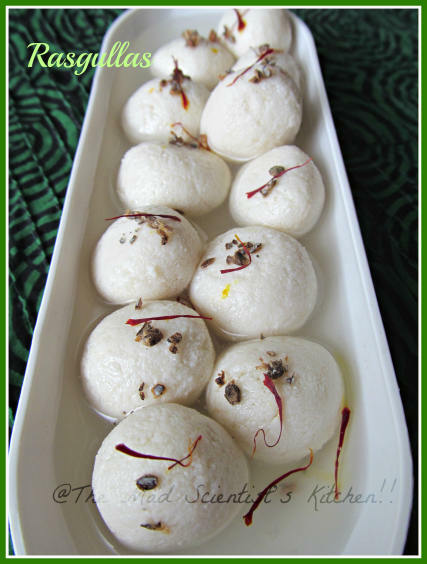 What better delicacy you could have chosen for R than that spongy dissolving Bengali sweet?Mouthwatering pictures!! Never get bored of these cuties, juicy,spongy rasgullas are just torturing me. The rasgullas look perfect, I guess referring two recipes hasnt done any harm :-)..btw, the link for parat (I guess you have given one) is not there! And wish I could taste some of the soft fluffy paneer balls too!! Very tempting!! Love those cuties!! If you say this is your first time making rasagullas. I am going to follow your recipe to the T Archana. They look so soft and spongy. I love the way you have put the kesar and elaichi powder on top. Archana my list for eating stuff is increasing day by day…keep them ready..the Goa visit is very soon…and remember to make these …ha ha…love them and kudos on your bravery..give me a hug on that so even I could be that brave and try these long to do rasgullas. Apa ayae to. I will start jotting down. Love your first click Archana.This is my fav dessert and yours look so spongy and yum! looks so pillowy soft – you did an amazing job for your first time! Mouth watering pics….looks so delicious!! This recipe come out so well and look delicious. Archana, it’s been a while that I am visiting here. Life is busy these days. Looks like you have a lot going on here, the whole Alpha bet series of recipes.. Great Going! Glad you are able to keep the up the same energy when it comes to marathons. Love these Rasgullas can’t take my eye out of them! they come out superb. 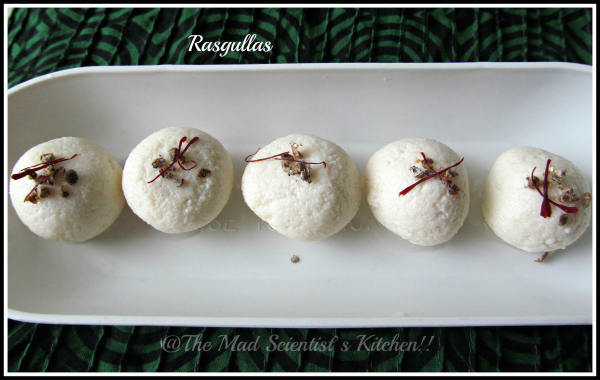 I have Never made Rasgullas from scratch, Now will do as I have your recipe.